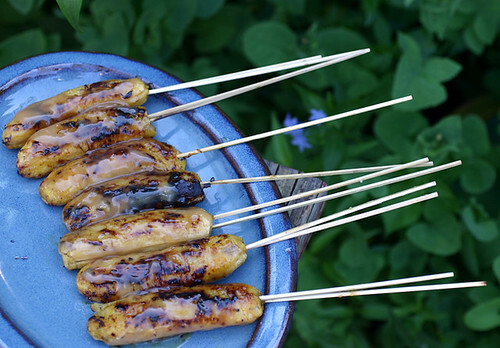 An easy simple treat to throw on the grill after dinner. The coconut milk really has a lot of flavor when reduced! 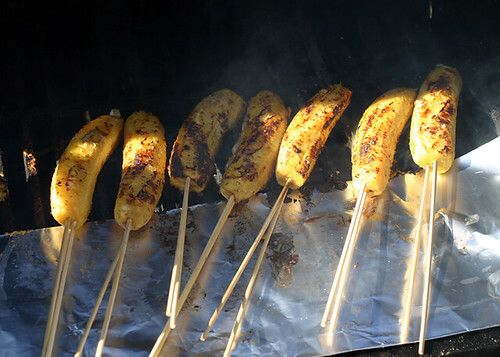 You can make the sauce up quite a bit in advance and have the kids skewer the bananas right before grilling. I used apple bananas if you use larger bananas Steve Raichlen advises to partially flatten them half-way through grilling for more even cooking. I advise to definently use two skewers or you’ll have a dickens of a time flipping them over. Bring to a boil whisking to dissolve sugar. Simmer until it gets thick and golden in color. Cool, can be made a day in advance, just bring it to room temp before using. Grill over medium-high heat on an oiled grate with a double layer of foil to protect skewers – as seen in the photos. Grill 1-3 minutes on each side then dip or brush on the sauce. Return to grill and continue to cook until they get dark and sizzle. Serve on platter drizzled with more sauce. I have thought about making these for a long time now, seeing these pictures its now a must do! looks wonderful! Those would be a big hit around here. Haven’t heard the word “dickens” in a while…cute! By the way we made your glazed peaches, they rocked, the sauce is genius! 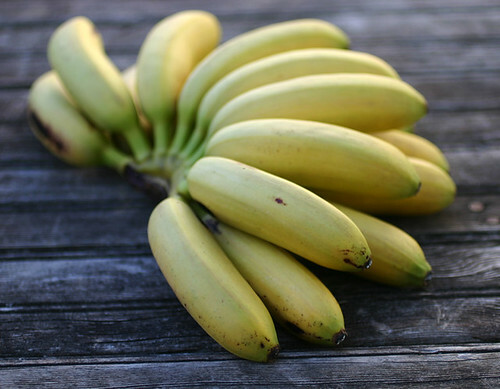 I luv banana what-evers…never thought of grilling them…can’t wait to try this. The banana’s don’t stick to the grates? Yum..luv it! Wow. This would be wonderful overtop some vanilla ice cream!! These look so fun for entertaining. Thanks! Wow…this looks great. This would be very good for BBQ party too. I would love to try. the sauce sounds very delicious. Good on a stick, on a grilled, with sweet sauce sounds perfect to me. Oh, I can do these! Two sticks would be a necessity for us. I tend to lose things in the coals all the time. Thanks! This looks so good. I have Planet Barbecue but haven’t had time to really go through it yet and I haven’t cooked from it yet. Can’t wait though. I agree that a double skewer would be the way to go as it will make it much easier to flip. Thanks for the recipe.